If you are a keen tennis enthusiast you will probably know the type of racket you need. You may be looking for more power, more control, more comfort… or a combination of all three. Whichever you decide you will have your logic behind your choice. If you do require some guidance, maybe we can help. We have prepared four categories of rackets to suit different styles, levels and age groups. This will only be a guide, but hopefully your style of play should fit into one of these categories. This will at least enable you, if nothing else, to narrow down your selection. This term is used by racket manufacturers for power orientated rackets. Maybe your technique doesn’t generate enough power, or you just want a more powerful game. These rackets tend to be longer in length (27.25 inches – 28 inches) to provide more reach and leverage in to the shots. They will have a larger head (more than 110 sq inches), be lighter in weight for easier manoeuvrability (225g – 265g) and have a stiffer frame. They are designed for players with shorter, slower swing styles who need a racket to create more power. *Test rackets are available in-store. Please call for details. This category would be used by professional and high-level club players. Players who can generally generate their own power through good technique so need a racket more for control. These rackets are usually heavier (290g -340g), they have smaller heads (90 sq inches – 100 sq inches), have thinner beams giving more control and are usually standard length (27 inches) but can be a fraction longer (27.25 inches). There are some rackets that are in that ‘grey area’ they offer some power and some control. These rackets are aimed at the player who has the technique but for whatever reason are unable to create the power needed, or they just like the feel of the racket. The racket will be a little lighter than a control/players racket (255g – 290g), they maybe a little longer than a standard length racket (27.25 inches – 27.5 inches) and the head size may be a little larger than a standard mid-size (100 sq inches – 107 sq inches). Basically if you feel that the game improvement/power rackets are not for you and the precision required to get the best out of the control/players racket is too much for you then maybe these are the rackets for you. Our junior range of rackets start at £20 for a basic aluminium frame and is ideal as a first time buyer’s racket. If you feel you need a racket with more feel, power and comfort then you need to consider a junior performance graphite composite racket. These rackets are either 23, 25 inches or 26 inches in length (standard adult size 27 inches). The size will depend on the age and build of the child. The quality will depend on your needs. Performance Junior rackets are for juniors who require a little more from their racket. They may be a higher club level player, county player and even a nationally ranked player. Suitable ages can be anything from 8 years of age up to 12 years of age (depends on build of child). We stock a range of fused graphite (Graphite/Aluminium) junior rackets that can also be classed as performance frames…these do NOT offer the same feel as full graphite frames but they do offer a more solid feel than aluminium’s. Fused rackets are priced slightly lower than full graphite’s at a starting price of £30 and finish up at around £55. If you are NOT playing in Tournaments then size you use will ONLY depend on your size. 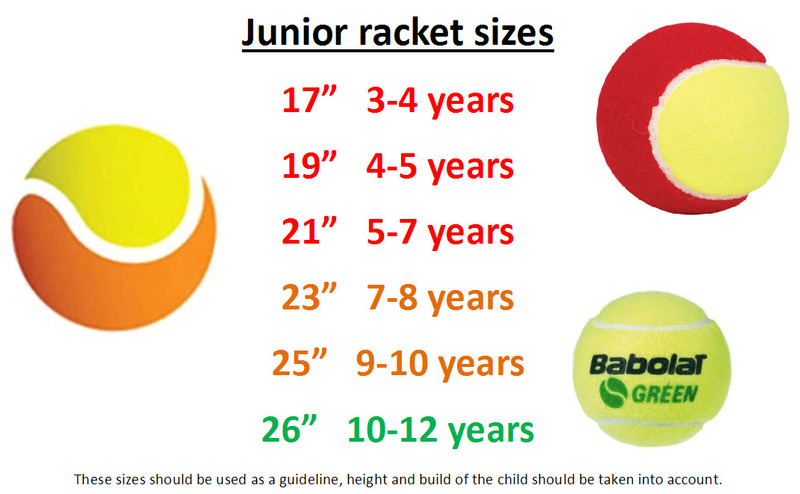 Here at Withers we can make sure the correct size of Racket is sold to you.